It's the off-season in the Northern Hemisphere and there is a noticeable shift in the winds. This competition season will be interesting at worst and exciting at best - There are many changes coming this year. Our Sport is evolving. As always, change brings with it some insecurity and controversy. What are the unintended consequences of good-intentioned rules and regulation? The PMA, DHV, and BHPA all are proposing changes to the rules at CAT 1 competitions that would restrict the use of prototypes and/or uncertified wings. The logic is that there are meaningful minimum safety certifications required for harnesses, helmets, and reserve parachutes - How can we possibly exempt the wings from all but the minimum inspections while saying that we are trying to increase safety? And I must say, I agree with this logic. . . although I do worry about unintended consequences . . .
Are we striving to provide a venue that is a proving ground for new technology that may help the sport by providing better performance and safety through better design? Until now, our relatively immature sport has been trying (fairly successfully) to include both of the above goals in our competitions. These goals are now being found (by some) to be mutually exclusive, however. For more discussion, with top-ranked pilots from all over the world, view this post on the PG Forum. I think we will, eventually, see some restrictions in equipment in all competitions except the PWC (the PG equivalent of Formula One). I know this option has idealistic roots and may not be feasible in a market as small as this sport; but I truly believe this route is best for the sport. The Rat Race June19th-25th will actually be two competitions in one. There will be a "SPRINT" version for newer pilots, those on lower performance wings, and those who just don't like flying for more than 3 hours. The tasks will be structured so as to have the two fields occupying the same air, along their separate courses, while the sprint task will be shorter and less into wind. I think the enjoyment level for many of the newer pilots will go up since getting to goal provides a smile. I like the idea of this format and hope it is successful in reality. As always, the Rat Race will have a mentoring program that is geared to help those who are new to the sport. Held in Hearn Texas, the Lone Star Nats Aug. 14th-20th is breaking new ground for paragliding in the US. It will be a tow competition - Every pilot will be towed up to altitude, prior to the start, by one of the many tow-rigs. This is being met with some resistance because everyone who's towed has a memory of one fiasco or another - often involving panic, long delays, or just frustration. The thought of having 8 to 12 winches towing up 60-100 pilots, in the hot sun, has many of us thinking that the hardest hurdle in the comp will simply be getting into the air. But I'm an optimist. I'm hoping to be able to make it to this comp because, if it's successful it will open the doors for a whole new type of competition and thousands of miles of unexplored XC territory. I'm actually pulling for Dave Prentice and his crew. They know they're under the gun and they appear to be working hard to provide a safe and efficient operation. It's going to be interesting - But why shouldn't it be? 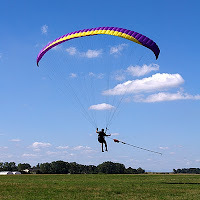 It's Paragliding! Today was a good day at MDO. I got back from my 8-day trip and was very happy to get back into the air. It was a beautiful day with 10 pilots on the ridge. Fortunately it was a large enough lift band that it allowed all to fly without stress. Nova Dasalla is a Bay Area pilot that has been on a quest for years. He's had his struggles and his successes, but he has shown that a goal and a positive attitude is what it takes to make your dreams a reality. Here is a short video of Nova's journey. It also shows why I don't do acro. Nova Dasalla - acro paragliding - "Infinite Stumbling" from avonorca on Vimeo. 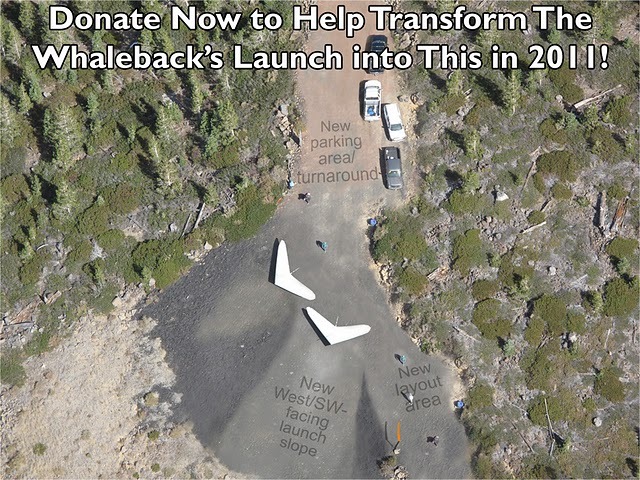 I'd like to pass along some info regarding the ongoing improvements to Whaleback (near Mt. Shasta, California) and the need for additional funding to make the project successful. 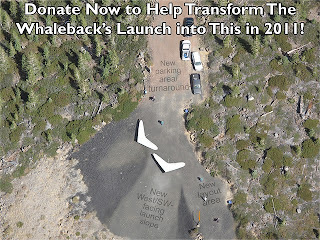 I've been in contact with Scott H. of the Rogue Valley HG/PG club and he indicates that many generous donations from clubs and individuals have helped the club approach their goals for the launch site and LZ improvement projects. They have applied for a matching funds grant from the Foundation for Free Flight and will make their presentation to the FFF in the next week or two. Please consider donating funds to this project, if only to guarantee the site's future and your ability to fly the site in the future. Donations from the community are the only way such a project can succeed. Donations made in the next week or two will count towards the hoped for FFF matching grant. Please do your part to improve this amazing site. Today turned into a nice day for flying, and Dan, Dave M., Jeremy, Adam & I all got a good taste of the best of Winter Cuesta. . .
We got to the top around noon and were greeted by light Easterly puffs. Birds were working weak lift in front, so we were encouraged. Within 30 minutes the light East had filled in and all the birds, all the flies, everything disappeared for an hour. We ate & told stories until things got still and the birds reappeared. Around 2pm it finally looked better, so Adam & I got suited up. 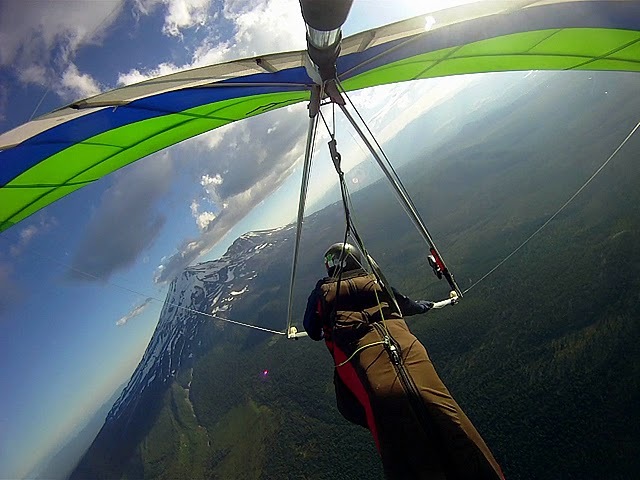 He grabbed his hang glider since he could do a no-wind launch easier than the rest of us. He launched well and sank out immediately to 200' below launch. Soon he contacted a good, if rough, thermal and climbed to 4000'. Meanwhile, I was standing in the chute ready to go and waited at least 15 minutes for a puff. Finally I got a very light puff, allowing me to get in the air and immediately climbed to 4500 and that was it. The conditions on launch improved and all got off well. It was quite cold at altitude but the lift was abundant and smooth above about 2500'. It was possible to move around quite a bit and I followed a weak lift line Northwest at a bit of an angle to the ridge for a couple miles before falling off the bubble and heading back to home turf again. When I headed out to the LZ it was quite lifty so I flew all the way to Hwy 1 and still had enough altitude to head back to the LZ. I thought about landing at Dave's (I had 1600' over the Hwy) but he's out of town and it just wouldn't have been the same without a ginger beer to celebrate. 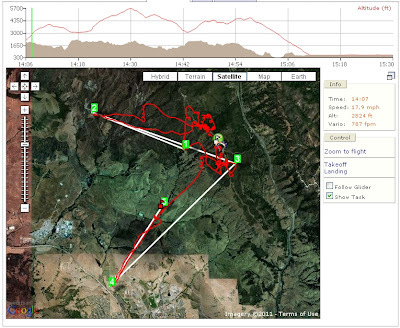 . .
Top of climb for Adam & me was around 5300' and it was good to see the models proven correct. . . It wasn't looking too good there for a while & I was worried that I'd cried wolf too early in the season ;-) Congrats to Dave M on popping his Cuesta cherry and the guys on sticking with me for 2 hours for the payout. My Flight track is HERE. I've got some cool video of the fun, but haven't figured out an adequate way to edit it without losing most of the quality. Today I'll take stills and have some pics.